Erza Scarlet is an S-Class Mage from the infamous magic guild Fairy Tail . Erza starts off as a lone wolf and stays loyal to following the rules. 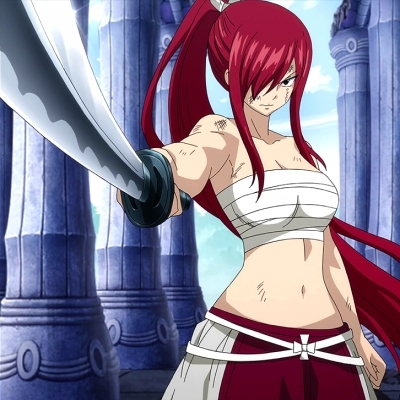 As the story develops Erza changes into loving mage strong and independent. As her terrible past haunts her she ignores her Nakama's calls that they want help. Erza's past starts with her working to build the dangerous tower called the Tower of Heaven also known as the R-System. Meant to resurrect Lord Zeref the evil Dark Wizard. Erza is taken back to the nightmares that she tried to run away from but failed because of her old friends holding her hostage. Having no choice but to risk her life for her Nakama she tried to fuse her body with a lacrima from the tower being directly hit and holding a lot magic energy inside. Uneasily getting ready to explode Natsu saves her from her nightmare once again. Erza uses re-equip magic. She is the strongest women in Fairy Tail.